Enviro-Bear 2000 is one of the craziest ideas ever seen in a videogame. It’s also somewhat shallow, as its author humbly acknowledges, and yet this is an incredibly funny experience! 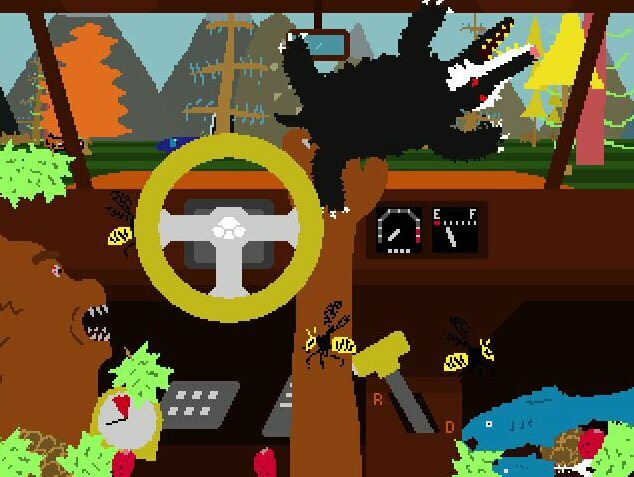 You play as a bear that drives a car in the forest and you have to collect fish, berries and other things to eat before you can happily go into a cave and hibernate. The thing is – as if this wasn’t crazy enough – you control everything in the car with just one paw. So you have to put the car into gear, then accelerate and brake, turn the wheel and everything else with your only paw. Not only that, you have to eat the fish that you run over while thinking about not crashing, not to mention that you can also get some angry bees in the cockpit who will sting your hand and hurt your driving skills. It’s a mess, surely, but a really funny mess, complete with some really bad 2D pixel-art that manages to become compelling and we wouldn’t want it any other way. Enviro-Bear 2000 has to be played, even if it’s just for 10 minutes of fun.